Now I’m not being edgy for the click bait, I genuinely believe we should take all blogger advice with a pinch of salt. Whilst this may seem like common sense to some, when you’re online looking for advice and desperate for answers you can find yourself taking words of wisdom from even the most questionable corners of the internet. Cosmo’s argument? “It’s important to remember that most influencers aren’t qualified, rarely speak to expert dermatologists, often don’t pay for products they use and can be paid a fortune to feature them.” Stop me if I’m wrong, but none of this is untrue. Whilst we like to say ‘I would never mislead my readers’, there will always be someone out there willing to say whatever to ensure their bills are paid each month. Forgive me for stating the obvious but your blog is based on your own opinion, not years of expert knowledge. Perhaps a few minutes of research on Google, but we’re certainly not qualified to dole out skincare & dietary tips at the drop of a hat. We’re all guilty of slipping up – our word is not gospel. 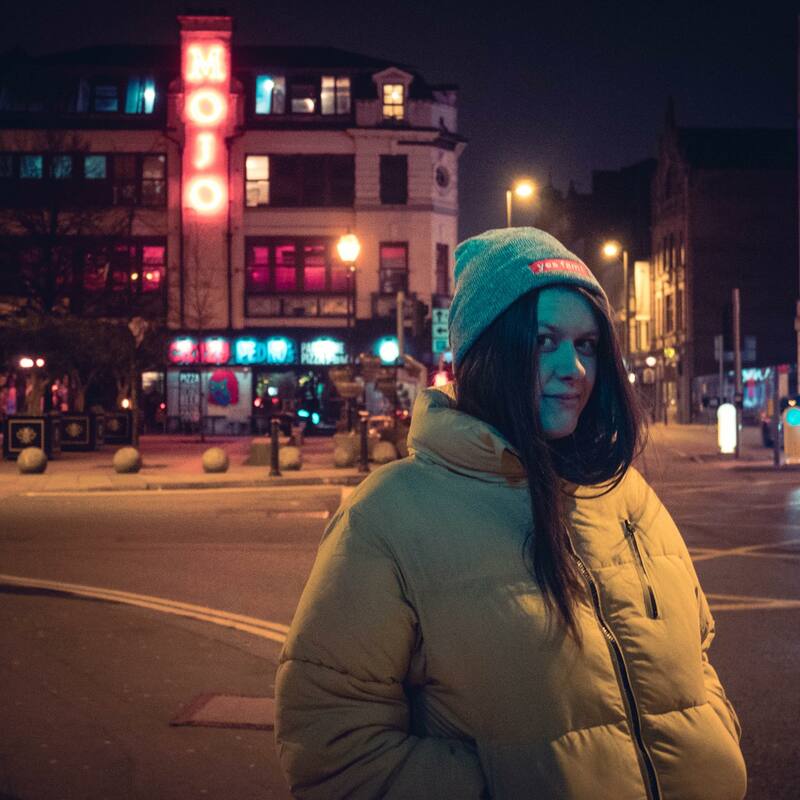 Now I’m not going to start naming names, because lord knows I can’t be arsed being called a bully, but I’d like to take an example from another blog that I came across on Pinterest a few months back. Said blogger was preaching the benefits of turmeric and had a big run down of tips and tricks for using it in your beauty routine. One of these tips was a facemask consisting of just turmeric and coconut oil. A two-ingredient miracle potion apparently. Perhaps the blogger would have thought differently if she had actually tried the recipe herself. I’ve written in sharpie so that you can see I haven’t bumped up the saturation. Just look at the opacity compared to the ink. Imagine if I had put this all over my face! Let’s say a young girl seeking skincare advice had tried this, do you think she’d go into school the next day knowing her face was the colour of a tequila sunrise? It’s not hard to imagine such a scenario. Just consider the impact this advice could have on someone. 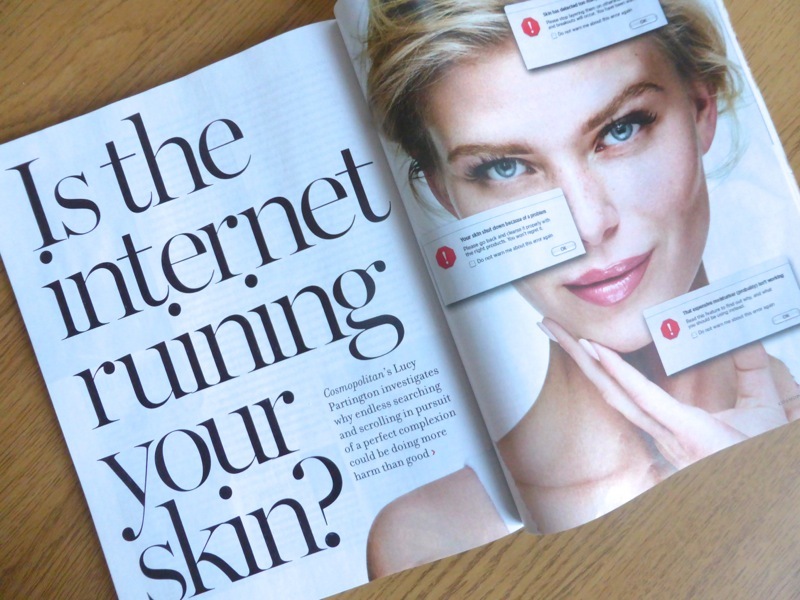 Research by Canterbury Skin & Laser Clinic found that from a sample of 1000 people 23% of had experienced a ‘bad reaction’ from advice they had taken online. There’s a case study in the Cosmo article who also admits that her addiction to Pinterest beauty tips almost ruined her skin. We can’t just sit back and pretend this doesn’t happen because you’re a bit offended by the article. Yes, but you can’t use this to derail the conversation. Of course print publications in particular need ads to fund their work, so they’re not in the business of slating brands. But when have you ever flicked to the beauty pages to read 500+ words on one specific product as you would with a blog? Usually features in a magazine surround an analysis on beauty trends and ingredients, rather than pure product advertorial. The pieces also have comment from voices of authority such as dermatologists and more than one personal opinion/experience to add context. There’s no denying that print publications are under much more scrutiny when compared to the Wild West world of blogging. We may scoff at the idea of ‘journalistic values’, but we have to admit that Lucy Partington at Cosmopolitan most likely adheres to a media ethics code unlike bloggers. Perhaps it’s time that we all took a step back and handled some criticism for once. It’s not always the print v.s online fight that we make it out to be. If we looked at articles like this and used it to better our own content, the blogging community probably would become much more credible than it is now. The cowboy bloggers spreading these terrible tips will be the ones defining the industry until we demand better. For now we’re going to have to eat slice of humble pie and accept that until media law and ethics codes catch up to the world of online content, we will judged by the industry as a whole. If you don’t want to be tarred with the same brush, I suggest you strive for better content. I’m always a bit scared of trying the homemade skincare recipes you get online. I want to get more into organic skin care but I think I’ll buy a book. Definitely won’t be using turmeric that’s for sure. You make a really valid point and we’ll reasoned argument but I think, like with most things, it’s the few spoiling it for the majority. I think that with both blogs and magazines, there is a chance the item being promoted is a sample or paid product placement so it is a little rich of them to slate bloggers as untrustworthy. Blogs are definitely for opinions rather than professional advice though. I personally turn down anything I haven’t tried myself as I would hate to be the person who recommends something that is awful. Although the press are scrutinised, when it comes to beauty, magazines are just regurgitating press releases. Unless they are quoting hard facts and figures, it’s just opinion, so there’s not a lot that can be scrutinised there. I don’t see them as any different from some of the bigger beauty bloggers at all. It tends to be the smaller ones who aren’t compensated in the same way that I trust. Yeah I don’t doubt that they get a million and one press releases a day, but articles like this have much more authority from trained professionals. It’s fine to have a second opinion, but bloggers aren’t experts that’s what the piece is saying. I think the important thing for people to remember is that beauty bloggers are not experts (usually) and that any advice is taken with a grain of salt. I do think though that the majority of people look to beauty blogs for opinions on products although I guess that perhaps teens would not realize that and could be swayed by promises of miracle “recipes” that some bloggers might promote. I definitely agree with your post! I couldn’t imagine putting turmeric all over my face but I bet people do! I’m here for this Hannah! Everyone raves about the Primark false nails but they legit flicked off about 5 minutes after I put them on. They we’re only £2 so not too expensive, but imagine if I’d believed the hype surrounding something more expensive. It really is, especially when you put a journo request out for comment and get nothing back! Sometimes experts don’t waste their time with small fry bloggers like myself, so it’s important to disclaimer work with ‘in my opinion‘. I agree that we not always trust beauty bloggers. However I would prefer such product reviews from regular users compared to those who will just post some release about a certain product. Yeah I definitely agree with you there. There’s still place for personal opinions, we just shouldn’t take them as gospel. I totally agree with this. What I really hate is bloggers that are still not disclosing when they are being paid to post something. I think that you need to be wary about what advice you take on. I might have read that turmeric mask post too it rings a bell although I think there might have been a spate of posts about turmeric at the time. Glad you wrote this to highlight that some don’t practise or trial what they rave about. I am not a beauty blogger, but as with any blogging it is merley an opinion or account of personal experience. I think that there is a difference between an established trusted beauty blogger and a wanna-be one who doesn’t really know what they are taking about and only wants a place for affirmation: online. But then again, some magazines (including Cosmo) do publish some ridiculous articles on beauty and home made treatments. I agree, sometimes I could not agree and trust with a beauty blogger they get paid to post a product but I love the one of the Pinay Vlogger she shares the honest review of the product based on her experience. Bloggers need to support each other in situations like this and seeing you side with the press is disapointing. Bloggers are unique because we are separate from the press and we give our opinions and our readers value these opinions. It’s only the same thing a columnist does. What is the point in the Cosmo Blog Awards if they don’t think our expertise is warranted? This article comes across as an attack because it is one. Valuing opinions is one thing, but taking them as gospel is another. I don’t really entertain the Cosmo Awards mainly because they’re just a big link building exercise. I do however think their point in this article was completely valid, regardless of the awards. You can celebrate an industry whilst still being critical, that’s completely healthy. For example, gamergate. I also don’t think the Cosmo Blog Awards celebrate ‘expertise’ in the industry. The point this article and my blog post are both trying to make is that whilst we love blogging we’re most definitely not experts and the things we say should be taken with a pinch of salt. We use Turmeric for our faces all the time in Indian natural skincare. You don’t see us walking around with stained skin do you? There are ingredients that can be used to wash it off as well. The right DIY won’t leave you walking around like you have jaundice. Yeah I hear you on that! But that’s the point of a blog isn’t it? If the blogger had tried this and done her research, surely she would have shared the tip to take off the turmeric. People are just churning out half-arsed articles without giving it thought and posing as experts. To clarify, my issue wasn’t the use of turmeric, it was the fact she suggested mixing heaped tablespoons of turmeric with just coconut oil. It was part of a huge list of ‘skin tips’ that I doubt the blogger had tried. 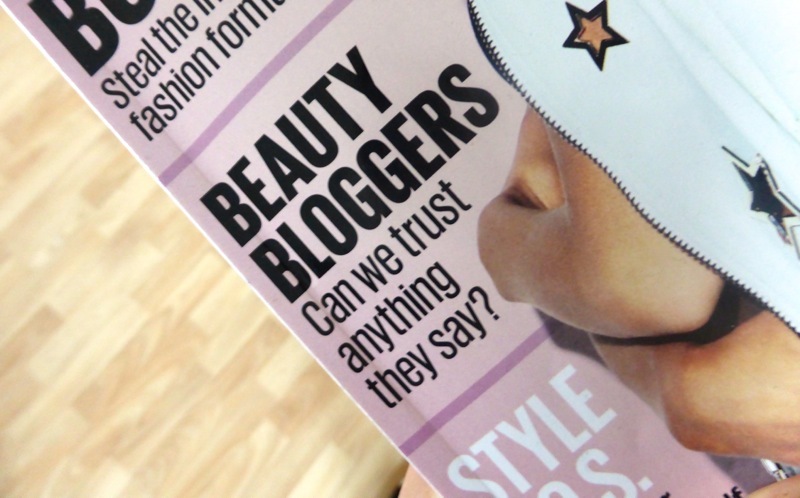 This is the problem with beauty blogging – sharing inaccurate information and saying its skincare to suit all. I agree with the article. I have been using turmeric & various other things for skincare for a long time. But I have never written about them on my blog as I know, something that works for me or my skin colour may never work for someone else. As a blogger, you need to understand that the only aim is not selling the product or posting something just for content sake. We need to be true to our audience too. This really annoyed me aswell, I will always test everything I review and review it honestly! The media are always trying to bash blogging because they know we are catching up with them. I would much rather read blogs than magazines these days. I agree! Instead of being resistant to a trend that is clearly continuing to gain popularity and attacking it, why don’t they ask themselves why consumer trends are changing. I truly don’t read any magazines because I find online content to new and interesting. When I did read magazines I felt like they just rehashed stuff I had already read for free on blogs so why would I pay for something that is often almost entirely advertising? Well in India , brides are asked to apply oil and turmeric before their wedding so that the skin has a natural glow. What bloggers miss to specify is that the turmeric used isn’t the powdered turmeric we get it store infact it is the whole turmeric (looks like ginger) because they don’t stain the skin and are not processed. 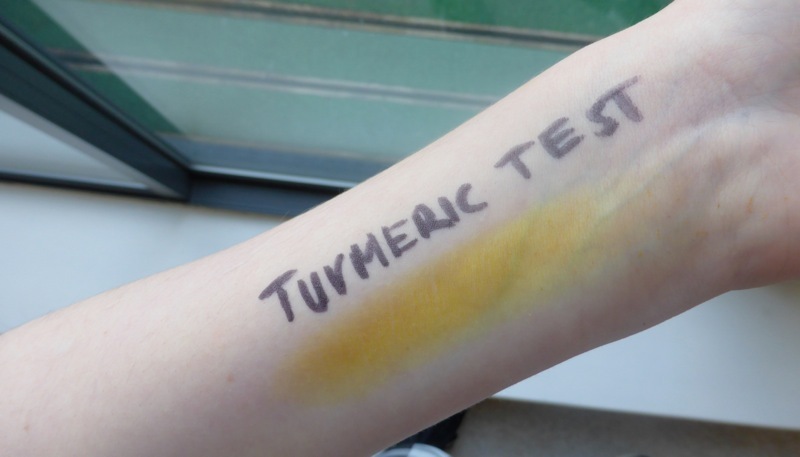 Also turmeric is used for people with yellow undertone , so the color looks like a glow. Beauty bloggers tend not to do the research before publishing anything on the internet. I normally put up a disclaimer that it worked for me and may or may not work for you . I understand that turmeric works differently on different skin types. That’s part of the point I’m trying to make. Let’s not get too hung up on the tip I tried. The point is that there are many similar pieces advice out there that, as you rightly said, have not been researched in the slightest! I think that’s a great idea to add a disclaimer. I think I might start to use one myself. I don’t do too many beauty reviews, but I have think you have to remember it is one person’s experience and opinion, what might work for you could be disastrous for someone else. Sorry I am going to stop you because you are wrong. Saying “beauty bloggers get paid a fortune to feature them” is plain wrong. I run a blog and I have written hundreds of reviews and I’ve been paid for three. Yep, three! Why would any blogger ruin their credibility and say good things about a bad product for a once in a blue moon payment? Now, I am not going to say I haven’t seen some bigger bloggers perhaps be tempted by a pay check, but for the most part, we put in hundreds, if not thousands, of unpaid hours because we love beauty and want to share that love. It is more about the beauty community which is something I think you have really missed here. As for not being expert dermatologist, you are right, but most bloggers don’t speak as qualified professionals. We speak as experienced and saavy consumers that have tried a lot of products and can thus provide a bit of wisdom to other fellow consumers who perhaps don’t have the time, money or inclination to try so many different things for reference. Sorry but I found this post wholly negative and unconstructive and I really don’t think it is your place to attack a whole group of people you clearly don’t understand. I love your passion Emma, but you contradicted yourself when you said “Now, I am not going to say I haven’t seen some bigger bloggers perhaps be tempted by a pay check” – that’s the reality, we cannot forget that this happens even if we hold ourselves to a higher standard. I’m not saying everyone does it. I have a beauty section myself. I know how much of my own money I pour into my own products and I know that there’s a good mixture of positive and negative reviews. This is absolutely not an attack – this whole piece is saying ‘hey take our advice with a pinch of salt. Look here’s an example of bad advice. Don’t trust everything you read online’ It is logical and constructive, but thanks for joining the debate regardless :). This is why I ALWAYS try out anything I’m recommending in my posts whether it’s weird beauty hacks or face masks. I hate beauty bloggers/vloggers that spread tips but don’t actually test them. I watched a video from a popular youtuber months ago about 100 beauty hacks in 5 minutes and I was debunking about a quarter of them in the comments section. I wish people would just put more time and effort into their posts. Just give us an honest review instead of a rushed post that hasn’t been tested at all. I completely agree with you. The difference between what bloggers publish and what magazines publish tends to be the level of scrutiny behind each piece. Yes magazines to adertorial content that is labeled as such and write from releases, but as a publication with a reputation to uphold their writers must fact check everything and do extensive research before a piece is published. I am saying this as someone who is a PR & marketing professional who manages media relations for a company. While some bloggers do research their products they are not held to the same standards meaning one blogger can do a ton of research on her piece and another can just be saying whatever she feels to be true. I have also found that smaller bloggers who do paid reviews feel pressured to say what they need to say to maintain the relationship and their check. Magazines and larger bloggers don’t do that. To your point, no all bloggers are giving out bad advice we just need to be careful and use a little common sense when we read. I partially agree with you. Well, for the biggest part. A lot of hobby beauty bloggers don’t rely on sponsors for their bills. I do find a lot of smaller beauty bloggers very reliable. That being said, beauty bloggers just write their opinions and experiences on their blog, but aren’t experts most of the time. Good thing to always keep in the back of your mind. Completely agree with you Mariska, we just have to take things with a pinch of salt! I think hobby bloggers are a huge part of the blogging industry and so many writers are now blogging for the love of writing, rather than a career. That said, I think it’s possible to share an honest opinion even if a post is sponsored – however, some people don’t. Well yes, but Cosmo’s own beauty articles will be based on the PR freebies that land on their desk and reviews dictated by the money given to keep the magazine afloat by the beauty brands. Frankly I thought this was an unnecessary slating of beauty bloggers in an attempt to make themselves look more authoritative. I’d rather listen to Caroline Hirons that the Cosmo ‘beauty team’ any day. I love reading beauty blogs and I am always up to try something new. But God gave me a brain to use so if I decide that something is not safe for my skin / hair / body I do not try it. Turmeric is still my favourite ingredient in home made face masks. Once I put a turmeric mask every day for a week to give my face some TLC. I know it can turn everything yellow but I am careful while applying and washing it off. And the yellowish colour of my face is usually gone after some time. And my family has a great opportunity to laugh at me with my funny face colour. Bloggers are just people so they can make mistakes. But they should write about things they know and already tested. And readers should remember that every person is different – what is good for some may not be good for them. I agree, anyone can blog and there is a lot of really bad advice out there. People also need to use their own common sense tho too! A part of me looks t that turmeric mask and wonders who would actually put that on their actual skin? Like everything there is good and bad and we have to find bloggers in which we trust to be honest and tell us the truth. Great post and I can totally see both sides of the spectrum. I myself have found. Is for years, wishy washy bloggers who aim to please and think everything is fantastic. Everyone thinks they are an expert. I myself only wrote about the things I know that work due to trailing and testing and producing hard cold facts. I do however think it is very misleading for a national print magazine to generalise such a statement about all bloggers. You can trust some. People like amodelrecommends and Caroline Hirons who aren’t in it for the money or the fame. But to tell their story. I have quite an investigative nature and really educate myself on ingredients and processes, but I will never claim to be an expert. It’s a very unprofessional place to be in, pointing the finger and saying whose more credable than who. Cosmo. You got it wrong. I do a lot of research on everything I write because I imagine I would lose all respect if I didn’t do that. A big makeup website in India launched their line of products and I think I was the only one who didn’t like it and have said so. This could certainly hamper future prospects for me. But that doesn’t stop me from stating the truth. And yes, I don’t expect anyone to take it as gospel as well. On the other hand, it’s easier for a lot of people if bloggers try them out and they don’t have to do all the testing out themselves right? Turmeric is not that hard to remove IF you know how. First, wash your face with a cleanser as normal, then follow up with micellar water (it removes like 70% of the yellow). Wash again, but just with water. Don’t dry your face with a towel! Apply oil to it while it’s still wet (I use jojoba oil). Let it do its thing for a few hours or overnight. Then use micellar water again and wash with a cleanser. Works for me. Thanks for the tip but I think you’re missing the point of the article. The blogger in question should have included this information in her tutorial, just in case. This post isn’t about just one bad instance, it’s about beauty bloggers failing to fully inform their reader. Whilst we need to take things we read with a pinch of salt, bloggers also have a duty to provide full information and balanced reviews. I can definitely relate to both sides of the argument. I’ve been a beauty blogger for years and I’ve grown as I’ve gone – I also point out that I am explaining how the product has worked for me. I have bought products that I’ve seen magazines rave about and they were shite, same with beauty bloggers. I’ve lost some beauty blogging friends as they’ve collaborated with brands for products – I’ve given an honest review in a diplomatic fashion – explaining it wasn’t great and not to buy it – while everyone around me raves about it because they want to work with that brand. Nope, just nope. I think it’s important for people on both sides to realise that honesty is the only way forward – experts can be bought, they’ve bills to pay. Bloggers can be bought – they also have bills to pay. At the end of the day, we all have to use our own common sense, be aware that not all products work for everyone, that things work differently depending on skin and people need to stop trying to one-up each other with their exciting new idea/review/product. Absolutely agree with you Aine. I guess there’s responsibility on both sides of the coin and people are becoming wiser to the way some (not all) reviews are manipulated. I totally understand where you’re coming from when you talk about other bloggers raving about bad products. Obviously everyone has an opinion but it’s easy to tell when some are not authentic. Thanks for taking the time to read my post and share your opinion. You know what gets rid of Turmeric, the sun. Yup that easy. I do a homemade mask with tumeric, organic honey, and cinnamon at least once a week. Never had an issue getting the stain from turmeric off. No reason to buy expensive harsh chemicals with endocrine disrupters. I’m a blogger and a facialist. If someone was so worried about the stained skin a quick google search and they would see how easy it is to fix. I do include this information on my blog posts for reference, but even those who forget are still giving homemade recipes that work. I’m less concerned with homemade treatments than store bought chemicals. Thanks for taking the time to read the post, but you seem to be caught up on one example out of many. When bloggers miss out information or manipulate their reviews, they put their readers at risk. I could have mentioned the bloggers who recommend PVA glue to get rid of black heads, or the multiple articles detailing the use of lemon juice with bicarbonate soda for teeth whitening. Heck there’s even bloggers who suggest mixing peroxide in your body lotion. Knowing others who work in your field I’m surprised you’d point people to Google as a fountain of knowledge considering how much bad and conflicting information is online. Sarah, you’re absolutely right. There are plenty of people who consult multiple articles, but unfortunately it only takes one to sway someone’s judgement. Especially if someone trusts that source over another conflicting source. So I personally believe we can do more as an industry to ensure we’re giving all of the information the reader needs upfront. I think it’s lazy for us to assume people will find the info elsewhere or that people will already know what’s good for them. You never know who will read your articles online so we can’t simply afford the luxury of assumed knowledge. If we created heavily researched articles, not only would this be good for the reader, but it also benefits the blogger as the Google Panda algorithm prefers in depth, rich content. It’s a win-win situation. Whilst I agree that we all should in part take responsibility for our own actions, bloggers should too and it’s time for us to embrace in depth, long-form content that truly helps inform people in the right way. If this cannot be done, we should take ownership by adding a content disclaimer. I completely get where you’re coming from but we should always be striving to do better instead of just taking the easy option.